Taps, Diplexers, and Splitters and Combiners: What’s the Difference? While taps, diplexers, splitters, and combiners look alike and serve a similar function, there are significant differences between these four devices. How will you know which one you need for your installation? Taps, splitters, combiners, and diplexers all accept your TV signal before distributing that signal to multiple receivers. Each one of these devices does this task a bit differently, however. This means you have to determine whether you need a tap, diplexer, combiner or splitter will depend upon your specific installation. Telling these products apart is easy – taps, diplexers, combiners, and splitters are usually labelled on the device and Solid Signal’s website. Knowing which of these devices your installation needs requires a little more knowledge. We explain taps, splitters, combiners, and diplexers to help you develop the unique aspects of these product categories and how each is used in a TV antenna or satellite installation. Let’s take a look at taps first. These devices, also known as directional couplers, typically have one input and two outputs. (There are multiport taps too, as well as those with multiple inputs such as six in, 12 out.) A tap takes a signal that’s too strong for a single device to use and splits it differentially. This means that the output leg going to an infrastructure device gets a weaker signal while the stronger signal continues to the next tap. These devices have at least 3dB port loss, which is roughly half the signal. Taps are typically used in schools, businesses, and other installations where multiple receivers are fed from the same signal source. As the name of these devices suggests, splitters evenly separate signal among the output legs. 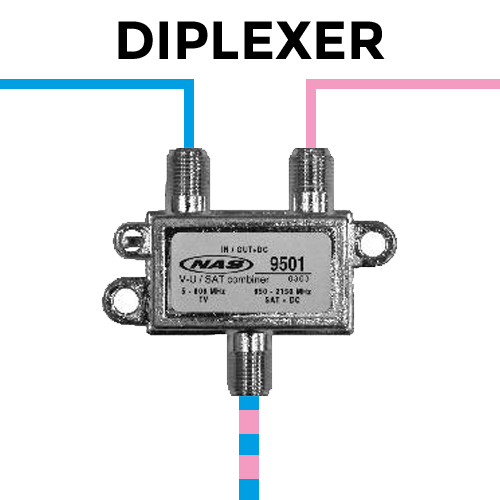 These units are often used to go straight to receivers or tuners, while taps are primarily used to go to infrastructure devices such as multiswitches and modulators. The amount of loss that’s significant depends upon the incoming signal level. 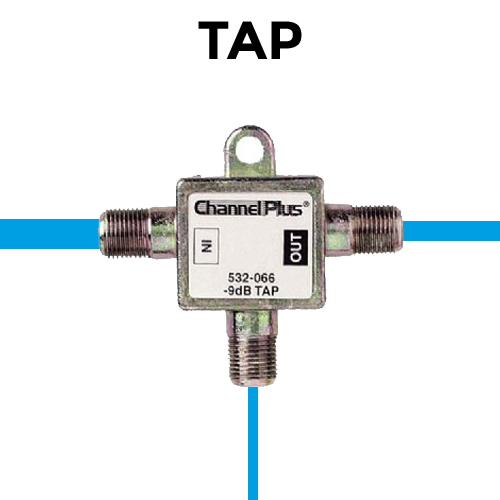 Like taps, splitters also experience a port loss of at least 3dB or roughly half the signal. A 2-way splitter has -3.5db signal degradation on each leg. 3-way balanced splitters have -5.5db-6.5db on all legs or -3.5db loss on one leg, and -7db on the other two (similar to using two 2-way splitters). Most 4-way splitters experience a -7db on each leg. An 8-way splitter experiences -12dB-14dB loss on each leg, depending upon the device. Combiners are passive devices that look like a TV signal splitter, but the similarity ends there. Combiners operate exactly as the word “combine” means – these devices take signal from two or more sources then merge them onto a single line. This does not necessarily create a stronger signal, however. A combiner only runs two different types of TV signals through a single cable to the input on a TV receiver. These devices should be used when signals are meant to be combined. In some cases, a splitter can also be used as a combiner by using the output legs as inputs and the input leg as an output. Diplexers are a small, box-like metal device with one input and two outputs, these devices look very much like taps and splitters. These devices actively combine two or more sources in such a way that only a small frequency range from each source is allowed to pass. 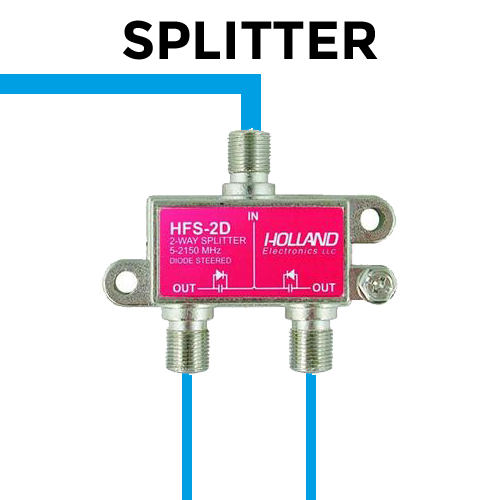 This ensures that the signals from each source don’t interfere with each other. Diplexers are commonly used in commercial installations where things such as cable TV, internet, and antenna signals must live on the same line. They cannot be used with modern satellite TV systems. These devices are splitters with built in amplifiers. Some units contain a potentiometer that increases or decreases the amount of signal from the booster as needed. This is used to counteract the effects associated with multiple splitters and long cable runs. 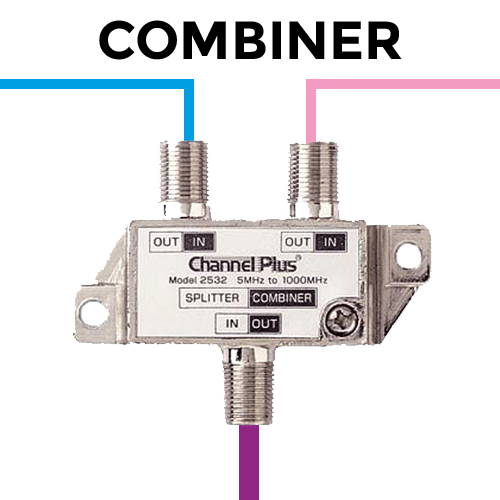 Like taps, diplexers, and non-amplified splitters, these amplified splitters resemble a small metal box with one input leg and two or more output legs. If you’re not sure whether you need a tap, splitter, combiner, or diplexer, don’t panic. Unless you’re an experienced TV antenna or satellite dish installer, it’s easy to get confused about the application of each of these products. To make things more confusing, different types of systems require different hardware. Devices designed for DIRECTV work poorly for television while units designed for cellular boosters might not work at all with any other type of device. If you’re getting ready to install your antenna and want to make sure you’re using the right device to separate the signal, call us at 877.312.4547. Our product experts will ask some questions about your installation before they recommend the tap, splitter, combiner, or diplexer you need. NICE AND EASY: Why is copper used for cables?